Europe is flirting with Havana and France has shown it. In Cuba, the national television and local media have announced with all the fanfare of communist propaganda the arrival of the French Foreign Minister, Jean-Yves Le Drian, who on Saturday said that his country wants to strengthen the already "positive" bilateral relationship. Contrary to what they believe on Venezuela, Europe is recognizing the new Cuban leader, who according to experts is a continuator of the work of Fidel and Raúl Castro, an omen of few changes. The arrival of the French Foreign Minister represents “the growing links between the European Union (EU) and Cuba”, after the political dialogue between the European bloc and the Caribbean was reestablished. The Old Continent and Cuba broke off foreign relations for almost two decades due to disagreements on human rights in the island, but above all, for the European position to follow the political game to the United States, and specifically, to the right-wing politicians of Florida. The "common position" of the EU towards Cuba was a restrictive position that prohibited all kinds of rapprochement. However, now history has changed and in addition to the democratic progress in the Caribbean country, Europe and the United States are having economic and political disagreements, so the Old Continent is "divorcing" its old ally. The Caribbean island is a tempting economic fruit for European investors who since the crisis of Cuba have been waiting for a substantial change in the largest of the Antilles. It is not a secret that the number of European businessmen who come the island with the aim of investing in the different sectors is growing every time. 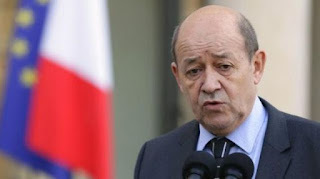 Foreign Minister Le Drian met with his Cuban counterpart Cuban Foreign Minister Bruno Rodriguez, but did not make official statements to the press. A meeting with Cuban President Miguel Díaz - Canel is also planned, but this has not yet been confirmed. However, it is possible to happen due to the interest of the Caribbean leader in strengthening some sectors of the Cuban economy in which France has great experience. According to sources close to the head of French diplomacy, he said that currently relations with Cuba are "very positive" and maintain a "dynamic" that the government of Emmanuel Macron aims to strengthen. On the other hand, the Cuban foreign minister reaffirmed that relations with France are a priority for the Cuban government. Last May both diplomatic representatives had met, a meeting assessed as "very positive" by both parties. "There is a good exchange of opinions among the chancelleries. The cultural, economic, academic and cooperation relations are going well and there is a significant potential to continue expanding them", said Rodríguez. Previously, in 2015, the former French President Fraçois Hollande traveled to the island to promote ties between both nations. With the visit, the Frenchman became the first European leader to return to Havana after the restoration of relations between the United States and Cuba. And although the Caribbean nation apparently has no tempting natural resource for the European powers, the largest of the Antilles is coveted by the world's leading economies since they want to join to the competition to become the main creditor of the Cubans in addition to the Chinese and in the last two years Russia that has strengthened its presence. Among the diplomatic advances between France and Cuba there are the renegotiation of the debt of the island with France and with the member countries of the Paris Club, a key step for Cuba to access international credit lines. Another of thing to highlight on the growing cooperation between Cuba and the Gallic nation is the opening of an office in Havana of the French Development Agency (AFD), which has launched cooperation projects, including a millionaire cooperative livestock development program. France has also invested capital in construction and engineering works such as the one related to the hotel industry, in which companies such as Bouygues carry out a large part of civil works. In fact, it was announced that France plans to invest 40 million euros to update the deteriorated rail network in Cuba. So far it is managed that the agreement between the National Society of French Railways (SNCF) and the Union of Railways of Cuba includes the modernization of two large locomotive workshops in Havana and Camagüey, the recovery of passenger cars and the putting into operation the popularly known "French train". Cuba, through companies such as Pernod Ricard, has tried to break the blockade, as well as protect its original brands. The important French trading company of rums has joined the Caribbean authorities to protect the prestigious Havana Club brand. Another important cultural link between Cuba and France is the presence of L’Alliance Française offices in Cuba to teach the language of the European nation, the development of French song contests as well as the celebration of a French Film Festival that has a great reception in the Island each year.